Thanks again for your info -- this time on the Zeiss Luminar 25mm. Sounds like the lens is best at just beyond the limits of the MP-E 65mm, so maybe I need something with a little more magnification. The working distance is perfect, however. Please remember that you would multiply the magnifications I quoted for the Zeiss Luminar 25mm by 1.5X if you are using a D300 sized sensor (23.6 x 15.8mm) or similar. Working distances and bellow lengths would remain the same as I quoted in my previous response. And just as important if you mounted the Zeiss Luminar 25mm on a bellows capable of extending beyond 102mm your magnification in the "good performance" range can go to 25X! Sometimes the extension limit of a bellows can be worked around by adding a adapter. Similar to the Beljan adapter, (It would add about 50mm), designed by, I believe, Klaus Schmitt. SOM, (Son Of Multiphot), a DIY macro/micro rig.w/120, 65, 35, 19mm Macro-Nikkors, Nikon AZ100 1X and 4X objectives. Nikon Plan Fluor W objectives, 10X, 20X, 40X. Zeiss Axiomat, incident BF, DF, DIC, Pol, Phase. With Zeiss infinity objectives, LD, Epi, APO, Plan types. Your "end product" needs of about a 6" printed image, and web-viewed images (of a couple sizes) are not as demanding as someone who has the desire to make large prints. So in contemplating the hardware to use, you can consider a higher f-number limit (smaller effective aperture). Still, with the camera you are using, I suspect you would be disappointed with the results if you are working at an effective aperture smaller than f32. What is "acceptable" can be very subjective. Since you already have the 65mm MPE you can do a pretty simple test to determine what will work for you. Just find a highly detailed subject and shoot it through the full aperture range. I think you will clearly see the point where the smaller apertures yield unacceptable results for your purposes. So for example, if you determine that an effective aperture of f32 is about your upper limit you can get an idea of the "marked" aperture at which you need to photograph. At 5:1 that would be (marked) f5.6. At 10:1 that would be about f3. Then you need to find a lens that performs well at those apertures. I would like to find microlenses that could approximate the results of an objective lens -- at 1/5 to 1/10 the time & effort. That's a very ambitious goal. I gather you're not intimate with the issue of diffraction, so let me walk through the basics using some of the numbers that you've given. As background, bear in mind that to a good approximation DOF, diffraction, and aperture size have a very simple relationship: doubling the f-number doubles the DOF but also doubles the size of the diffraction blur. The size of the diffraction blur places a strict bound on how large an f-number you can use and still get the resolution you need. You've mentioned making a 6-inch print for a journal article. I'll presume that means an image to be reproduced as 6 inches in its long dimension. The journal will impose some resolution requirement appropriate for their printing process. For example, the journal Science currently says "Grayscale and color artwork should have a minimum resolution of 400 dpi, and a higher resolution if possible." 6 inches at 400 dpi is 2400 pixels, so what you need (for a 6 inch image in Science) is a lens that can resolve detail at the level of 2400 pixels. Your sensor is around 22 mm across, conveniently the same width as a field number 22 microscope eyepiece. That means we can use Nikon's calculator "Digital Camera Resolution Requirements for Optical Microscopy" to work the relationship between magnification, aperture, and pixel counts. The trick to using that calculator for this purpose is to set FN=22, set CCD Format of 1", and adjust the slider for Video Coupler Magnification until the selection rectangle is the same width as the eyepiece circle. Then you just select an objective and read off the pixel count requirements. For a 10X NA 0.25 objective, the calculator says you need 4000 pixels across that 22 mm field. But looking at it the other way around, the calculator is also telling you that at 10X you need NA 0.25 to give you detail for 4000 pixels. If you need fewer pixels, you can get by with a smaller aperture, but only in the same proportion. For your example, that's 2400:4000, less than a factor of 2 reduction and far less than the factor of 5 to 10 that you've indicated you want. The bottom line is that you're bound by the physics of image formation. 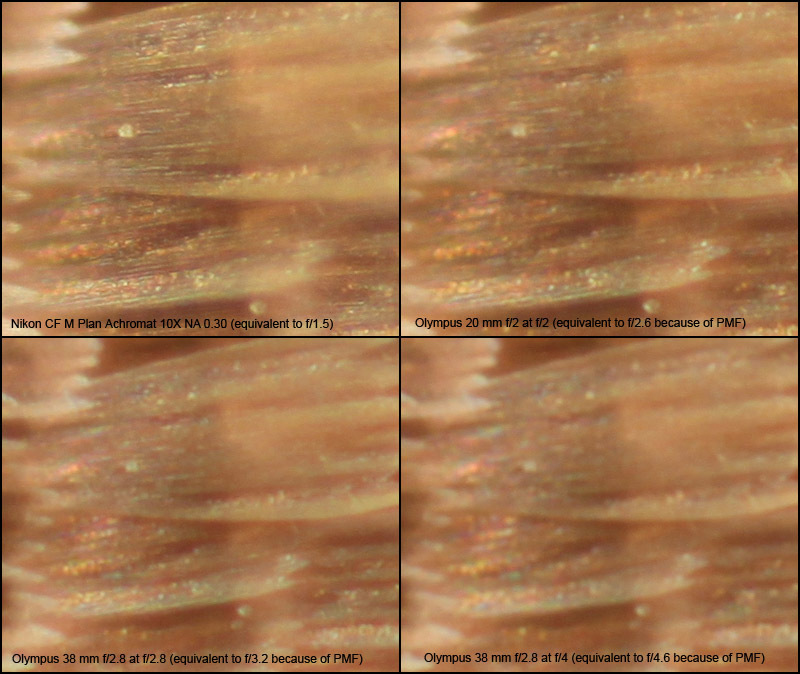 To get by with 1/5 to 1/10 the effort of shooting with microscope objectives, you'll have to settle for images that have 1/5 to 1/10 the resolution of microscope objectives. That can be done for very small reproduction formats, but it's not practical for 6 inch prints or even for modern wide-screen computer monitors. NU: I have used an EL-Nikkor 50/2.8, at modest extensions only (4-5x area). I did like the results -- though I think the MP-E beats the lens at this magnification. I should get some extra tubes, and try the lens extended way out though. Hokan: Ah yes, always these variables that I seem to have trouble keeping track of... I have to admit that my operational system is much simpler: "Here's something -- think I'll give that a try." It would be interesting to see a crop from a sharply focused single image from the stack... of a detail something like the serrated edge of a scale like those seen in the lower left quadrant on your posted comparison. Seems like it should be "crisper" (in the Luminar image as well) and a single image could indicate if somethings going on in the stacking process. Here is a 600 pixel crop without any post processing. 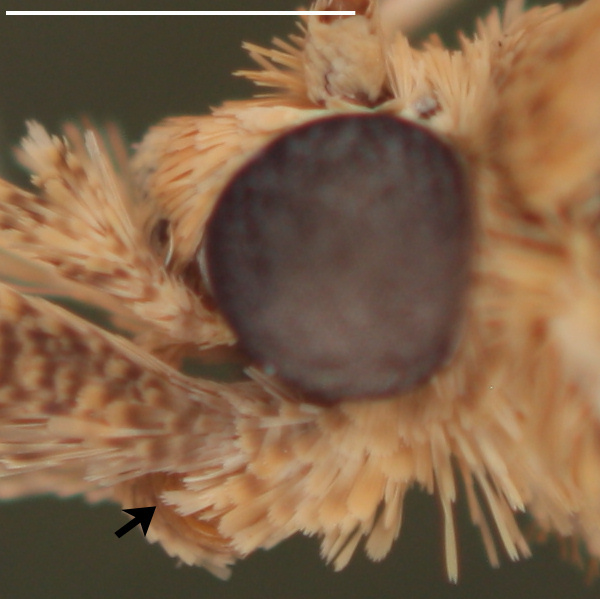 Took the image in which the scale pointed out by the arrow appears sharpest. View on sensor was 12mm wide, hence 2x. The white bar indicates 1mm. Thanks for your replies! On further reflection, I believe I 'misspoke' about the image size I will need (Doh!). Seems to me (now) that 3 to 4" is more realistic (especially considering the physics!). I understand that I definitely will need a fairly fast microlens. Good choices. But I'm curious... you mentioned a 20/2 Olympus in a previous post. Other than a physically more "narrow" piece, what do you think you will be "gaining" over that lens? Don't know what's going on, but these should both show much better detail at 2X and f5.6 or so. It does't really look like motion/vibration blur, but can you give a little info on your hardware "arrangement"? I've had the feeling that my Zuiko 20/2 just wasn't as sharp as originally expected (compared to the MP-E at the low end, and the Minolta & others at higher mags). But I wasn't positive about this because I couldn't compare the 20/2 directly with the rest due to lighting differences; the Zuiko needed fiber optic flash, while the rest work with the Twin Lite. Another reason is my dumb mistake: I had been using f4 consistently (I think I had read that somewhere?) but just recently have tried shots at f2.8 -- and realized that this was sharper (big difference at 10x). So, now I know that I must do more shooting at 2.8. The Zuiko 20/2 is a very nice lens, with lots of features (nice helicoid). But I don't use the auto features, and overall would prefer a sleeker version. Optics: I'm still uncertain. I ran some lens tests this afternoon that may illustrate what I've been talking about regarding the tradeoff between DOF and resolution. What I'll be showing here are images from a Nikon CF N Plan Achro 10X NA 0.30 objective, a 20 mm f/2.0 Olympus bellows lens, and a 38 mm f/2.8 Olympus bellows lens. Here's the overview of the subject. We'll be looking closer at the area in the black rectangle. Here is a mosaic of images shot with the indicated optics. These are all shown as actual pixels coming from a Canon T1i at 4752 x 3168 pixels. No stacking, no adjustments of any kind except for final reduction to jpeg for posting, and I checked to be sure I couldn't see any effect from that. Notice the very regular loss of resolution in proportion to f-number. If you're trying to determine a tightly optimized setup for shooting the fewest possible frames, then the key parameter is resolution -- how little can you get away with? Once you've decided on the required resolution, then you can pick a lens and aperture setting to give that much and no more. In my current arsenal of lenses, there's an obvious gap between my 10X NA 0.30 objective (equivalent to f/1.5), and my Olympus 20 mm f/2 bellows lens (equivalent to f/2.6 after correcting for pupillary magnification factor). If I want more resolution than the 20 mm f/2 will give me, I have no choice except to jump all the way to the objective. In some cases, that's overkill. If I cared, I would think about populating that gap with something like an NA 0.20 microscope objective. BTW, I tested the Olympus 20 mm f/2 at larger f-numbers also. It is sharpest at f/2 (wide open). I also tested a Luminar 16 mm f/2.5 (not as good as the Oly 20 f/2) and an EL Nikkor f/2.8 at f/5.6 (ghastly compared to everything shown here). All images shot with fixed illumination (desk lamps and paper diffuser), using electronic first shutter curtain and automatic exposure at ISO 100, actual exposure times ranging from 0.25 seconds for the NA 0.30 objective to 1.6 seconds for the Oly 38 at f/4. The Nikon objective and Oly 20 mm were both shot at 10X, using the Nikon on 200 mm extension (from sensor to shoulder of mounting threads) and the Oly 20 on a somewhat longer extension to match the magnification. I couldn't quite get 10X with the Oly 38 mm using my longest extension (two bellows ganged, giving 400 mm), so I just went with the slightly less magnification that the 400 mm extension gave. Once you've decided on the required resolution, then you can pick a lens and aperture setting to give that much and no more. OK, I confess -- I fudged the rule to keep the concept clear. Of course when you're stacking, you always get some amount of focus banding: sharp, not so sharp, sharp again, not so sharp, and so on. If you select an aperture such that the very sharpest parts just barely meet your criterion, then you have to use very shallow focus steps to avoid missing your criterion in the not so sharp parts. The best available theory (originating about 40 years ago!) says that you get the most DOF meeting any specified criterion if you open up one stop beyond the point where the sharpest plane just barely meets that same criterion. However, that same theory implies that if you stack at step = DOF, you'll get focus banding where the resolution differs by a ratio of about 7:10 between the most and least sharp areas. If that's unacceptable, say for esthetic reasons, then you should stop down a little farther and take a little shallower step. Rik: Can the title be changed to something more relevant, something like "Lens resolution" (Nikon Multiphot brings $3,550 doesn't do justice to the info. here). Eric: what small parts of insects are you photographing? I have the time to 'play around' and if you are working on Asilids I have some and can play around with those; but if it's fruit flies then good luck! Rik, many thanks for doing those lens tests -- which I find to be very informative. I'm especially interested in your findings re. the OM 20/2 -- beating out the Luminar 16 and EL-Nik 50/2.8, etc. And your remarks about the OM 20/2 being sharpest at f/2 really surprised (and embarrassed) me. (Means that I've been using this lens incorrectly for some time!) I will definitely have to revisit all of my prior attempts to use this lens, as well as find a way to adopt it to use with the Twin Lite flash. During stacking, I have been very cautious about keeping to open aperture settings (4 at the smallest) on all lens used. This was because of the excellent information provided by you, Charles and others in these forums. (Charles series of tests with the lichens and MP-E being especially compelling.) I certainly have been in error by not trying the Oly 20 at more open apertures! Is this unusual -- to find a lens best at wide open? Seems I'm always hearing about "more sharpness if closed down one stop..." etc. BTW, this PMF (pupillary magnification factor) is a new one for me. Is this unusual -- to find a lens best at wide open? Seems I'm always hearing about "more sharpness if closed down one stop..." etc. I would not necessarily say more "sharpness" but overall better image quality... yes. Certainly true with the vast majority of lenses designed for "normal" photography. But absolute resolution is directly tied to the size of the aperture. In a "perfect" lens (doesn't exist!) the larger the aperture the higher the resolution. But there are myriad other optical problems (aberrations) that need to be corrected in order to provide a good image. Take a "typical" 50/1.4 conventional lens. These are often performing at their best about f2.8 or f4. Some are very good at f2. Most will have some "issues" wide open (at least relative to f2.8 ), but if you are photographing the "black cat in a coal bin" with ambient light, a hand-held shot at f1.4 and 1/30 sec will usually look better than a hand-held f2.8 at 1/8. At the subject distances (magnification) a lens like this is used you typically don't really worry too much about losing resolution to diffraction unless you set the smallest apertures possible (often limited to f16). Now jump to a "micro" lens. 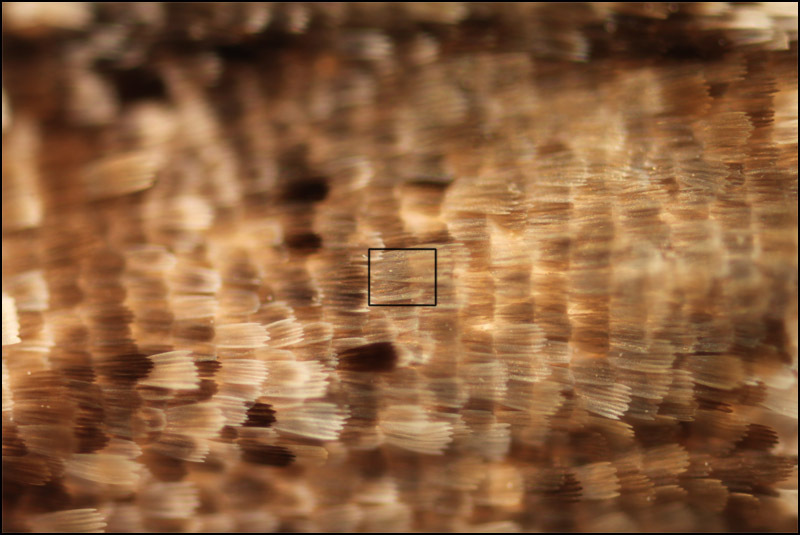 They not only need to deal with the same aberrations, but now need to address the fact that with high magnification comes high effective apertures, and detail can turn into "mush" if the lens is used at a small aperture. So with these lenses, the better quality ones will perform near their best at large apertures. I'm sure that many of these lenses actually do have better correction for some aberrations if stopped down a bit. But since we are often working at magnifications where any "stopping down" at all can produce an observable loss in resolution it becomes necessary to strive for the best "compromise" between resolution and aberration correction. The very best lenses can be used at, or very near their maximum aperture. Whether a lens works best wide open was largely a marketing decision that drove the technical design. Most ordinary lenses compete partly on maximum aperture, the better to handle low light, make fuzzy backgrounds, etc. In that market, the "sweet spot" for lens design is to make the aperture wider than it would need to be for best image quality. Macro/micro lenses designed for bellows use in a studio compete mostly on image quality. In that market, the "sweet spot" is to make the aperture only as big as the best image quality. That gives the designer a little more freedom by making the components thinner, and it may also cut manufacturing costs. Of the lenses that I own, only the specialized macro lenses (Luminar and Olympus) work best wide open. It's also worth emphasizing Charlie's point that best resolution and highest overall quality can occur at different points. This is especially obvious with microscope objectives used for brightfield applications. In this case the objective can essentially be stopped down by adjusting the diaphragm of the illumination condenser. Standard advice is to close the diaphragm to use 70% of the lens diameter if you want best contrast and good resolution, or to open the diaphragm completely if you want best resolution with some contrast loss. This distinction is caused by lens aberrations that affect low frequency information differently from high. See http://www.bobatkins.com/photography/technical/resolution.html for more discussion about that. Regarding pupillary magnification factor... The issue here is that some lenses act like their aperture size changes depending on where the focus planes are placed. You can recognize such lenses by observing that the aperture appears to have a different size as viewed from the front and the back. The standard method of rating a lens is to use the measurement as viewed from the front. However, when the lens is extended to give high magnification, what counts is the measurement as viewed from the rear. If the rear measurement is smaller than the front, then when the lens is extended to give high magnification, it will appear to have a smaller aperture than the rating suggests. The Olympus 20, Olympus 38, and Luminar 16 all have smaller rear pupils and thus act like they have smaller apertures than their ratings suggest. This is vexing, because these lenses are specifically designed to be used on long extensions and thus it's guaranteed that the effective aperture you see will not be the one printed on the lens barrel. But I think it's not a deliberate attempt to deceive, it's just an unfortunate side effect of the standard procedure for assigning lens measurements. Thanks for your offer re. Asilidae. 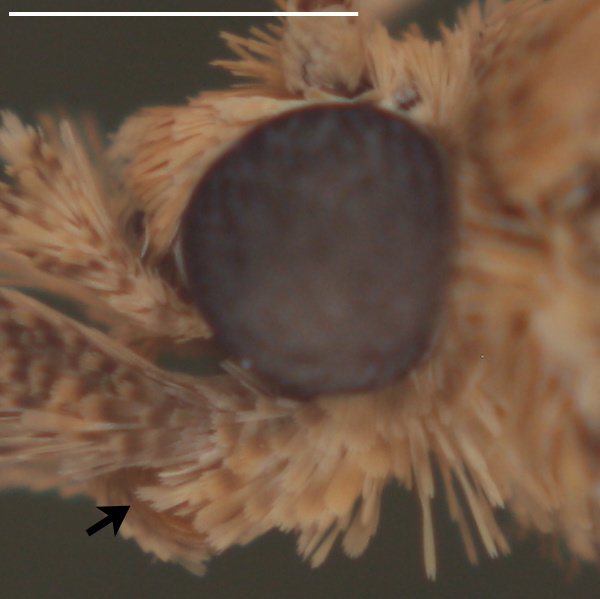 I'm striving to produce acceptable images of genitalia parts of relatively small flies (entire fly: 5-6mm long, genitalia < 1mm), which are mainly new species from Costa Rica & Panama. In earlier years, I would have relied entirely on drawings or SEM shots. But the former method is too tedious & difficult for me now, and the latter is much harder since retiring. With the advent of high resolution stacking methods, it seemed to me that photography was worth pursuing. Like all good methods, there is a distinct learning curve involved...; I need to muck along on my own. BTW, I added some images to your "Ping pong ball diffuser" subject; hope you don't mind (should have asked first...).